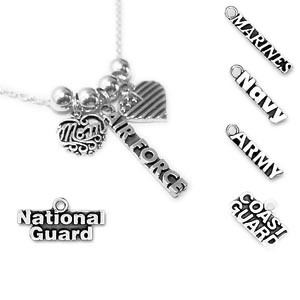 National Guard Mom necklace comes with a National Guard charm, a MOM charm and a USA Heart Flag charm. Shown on a 18" - .925 sterling silver ROLO chain. National Guard Mom charm necklace comes with a National Guard charm, MOM charm and a USA Heart Flag charm. This is a beautiful .925 sterling silver heart, flag and National Guard charm necklace. You may substitute the sterling silver National Guard charm for an Air Force, Army, Navy, Marines or Coast Guard charm. I also have a Military WIFE charm and Grandma charm option you can substitute for the MOM charm. The necklace is a sterling silver and you choose the length and style. A rolo chain is shown. National Guard Mom Charm Necklace comes with a National Guard charm, a MOM charm and a USA Heart Flag charm. Shown on a 18" - .925 sterling silver rolo chain.